Een Maisonnette op een uitstekende locatie die uitkijkt op het zwembad met majestueus uitzicht over de wijngaarden en de gehele ketting van de Atlantische Pyreneeën. Clos Mirabel is een mooi vijftien hectare landgoed tussen kust en bergen. Het C18 Manor House is gevestigd in een privé park, midden in de zachte heuvels van Jurancon, met een prachtig ononderbroken uitzicht over de wijngaarden in de gehele ketting van de Atlantische Pyreneeën. Een oase van rust, steeds veranderend licht en rust, Clos Mirabel ligt op een paar minuten van Pau en zijn golfbanen, dertig minuten van Lourdes en minder dan een uur van de bergen en skigebieden, van de Atlantische kust (Biarritz, surfen en golfen) ), Pays Basque en Spanje (San Sebastian, Bilbao, Pamplona). In het midden van dit opmerkelijke landschap biedt Clos Mirabel verschillende keuzes om in comfortabele, onlangs gerenoveerde en goed uitgeruste ingerichte accommodaties, vakantieverblijven en Bed & Breakfast te verblijven, of u nu voor werk of vrije tijd wilt verblijven: Het Manor House slaapt 14. De Manor House en het appartement slaapt 16, of 20 met The Winery. Het Gatehouse (6 personen). Het Manor House Appartement (4 personen). De Winery Studio (slaapt 2/3) en de Loft Apartment (slaapt 4/5). B & B is ook beschikbaar in het herenhuis met ontbijtbuffet van lokale en regionale producten die u in de eetkamer of buiten op het terras kunt nemen. Tarieven van 99 -159 euro per nacht per kamer inclusief ontbijt. Een zeer bijzondere plek om te verblijven. De uitzichten van de wijnmakerij zijn echt prachtig. De woonkamer geeft rechtstreeks op het terras op het zuiden van het zwembad met een uitzonderlijk uitzicht over de wijngaarden aan de hele ketting van de Pyreneeën. Het terras aan het zwembad is de perfecte locatie om te ontspannen over een glas wijn en 'al fresco' dineren en langzaam te kijken naar de glorieuze zonsondergangen. Slaapt 6/9 met de toevoeging van de Winery Studio. A most beautiful location for a family holiday - we all loved the pool and the views. The accommodation was spacious and comfortable. The staff were helpful and friendly. We had dinner at the Manor House which was delicious. Lots of choice for accommodation in B&B or self-catering. My family and I stayed at the Winery for 3 days, 4 nights in early April and we loved every minute. The winery, which sits alongside the Manor House, had everything we needed for our self catering stay – cooker, over, fridge, microwave, kettle etc. It was comfortable, warm and spacious. I have a real soft spot for wooden floors and those lovely French shutters and the winery didn’t disappoint. The English/French speaking hosts, Benoit & Maryse, were extremely friendly and always on hand to answer any questions or give advice. The most spectacular thing about the Winery, however, is its views of the Pyrenees which are second to none. Having never had much to do with mountains, I have a new found fondness for them. 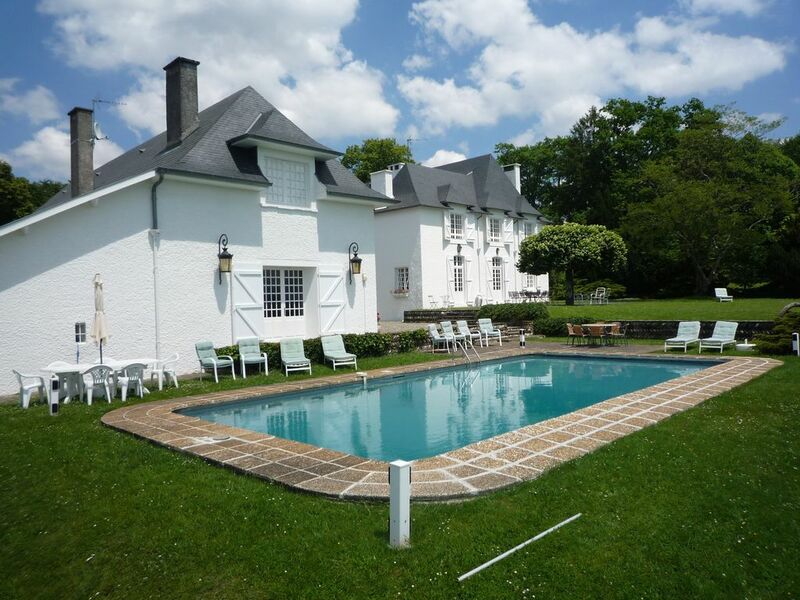 My two young boys had plenty of space to run around safely in the grounds immediately surrounding the Winery and the Manor House, which meant my husband and I could relax with some local cheese and wine by the pool and take in the lovely ambience. On a practical note, Clos Mirabel is just a short drive from local supermarkets where you can pick up just about anything you will need. From the end of August 2013 to the end of June 2014 our family (my husband, our three children and me) had the great privilege and pleasure of living in the apartment in the Winery at Clos Mirabel. Clos Mirabel has such a fortunate location – it was the most wonderful base for our ten-month long stay in France – just next to the larger city of Pau but at the same time undisturbed and close to nature. However, it was not the absence of noise we enjoyed the most – but the presence of a very special atmosphere of calmness and serenity that is characteristic of Clos Mirabel. The view towards the Pyrenees is something quite extraordinary, there is so much sky above one’s head and the ever-changing beauty of the landscape was something we enjoyed every day, even in the dark months. We simply all thrived there. Clos Mirabel was also a convenient starting point for many trips to the Basque country, the mountains (all seasons) and Spain. Ann and André were very kind and attentive landlords, we could always turn to them for advice and help, it was a great comfort to have their knowledge of the area always at hand. In short, our stay has given us lifelong memories that we will always cherish. We stayed in the Winery Apartment for a week and thoroughly enjoyed our visit. Our hosts Andre and Ann were very helpful in terms of restaurant and sightseeing recommendations, and the accommodation is well presented and in a beautiful location - not far from the amenities of Jurancon and Pau, but with a real rural feel. I'd recommend exploring the Vallee d'Ossau which is close by - magnificent mountain scenery everywhere! Overall a lovely spot to stay and I'd highly recommend it. Thank you for taking the time to submit this review. It is very much appreciated. The Winery has just been completely renovated which has made it a much more attractive & comfortable apartment. The magnificent views from the apartment of course remain the same... We currently have many cyclists staying who are trying the Tour de France route and practicing for the next étape. As you suggest,our guests who enjoy walking are discovering all the beauty of the Vallée d'Ossau. Seeing the Pyrenees from the terrace is wonderful and visiting the Pyrenean National Park is so easy, just 40 minutes door to door. We hope to have the opportunity to welcome you back to Clos Mirabel on another occasion. Very kind regards, Ann & André. This was the priciest of our verbose rentals, and the one most nearly approximating a five-star hotel. ( There is a small pool.) As other reviewers have remarked, the hosts are especially gracious: by all means accept their recommendations for local dining. And be sure to pick in The wine store of Gan the sweet dessert wine Clos Mirabel bottled from grapes grown on the property. The apt for two in the Winery with the views was worth the price. die Atmosphäre im Haus, anders als auf den Fotos , trist. Eine eigene Terasse hat man nicht, man sitzt draussen im Grass am Pool. Der pool wird zu jeder Tageszeit mehrmals durch einen Poolroboter gereinigt und ist dann für 2 Stunden blockiert. so dass dann die Nachtruhe erstmal beendet war. Clos Mirabel ligt op 5 km van Pau, tussen oceaan en bergen, op 1/2 uur van Lourdes, het Pyreneeën National Park en minder dan 1 uur van de Franse en Spaanse skigebieden, de Atlantische Kust met surfstranden, zeilen en een aantal De mooiste golfbanen in Frankrijk. Biarritz, St Jean de Luz en San Sebastian zijn binnen handbereik, zoals Bilbao en Gugenheim, en Santander. Gelegen in het hart van de wijngaarden van Jurancon is het ideaal om te wandelen en klimmen, golfen, skiën, wijnproeverijen en gastronomie .. De streek staat bekend om zijn eten en wijn. Clos Mirabel ligt zeer dicht bij Pau en alles wat het te bieden heeft is: het Chateau, Casino, golfbanen, racecursus en showpringen, zijn Grand Prix. De luchthaven van Pau Pyrénées is 20 'weg met vluchten naar Londen, Bristol, Amsterdam, Brussel, Parijs en Lyon. Lourdes Airport is 30 minuten, Biarritz 1 uur, Toulouse 2 uur. Can­cel­la­tion Pol­i­cy If a con­firmed book­ing is can­celled af­ter pay­ing the 50% de­posit but over 3 months be­fore the start of the ren­tal pe­ri­od, a can­cel­la­tion charge of 25% will be made. If a con­firmed book­ing is can­celled within 3 months of the start of the ren­tal pe­ri­od, the to­tal amount of the de­posit will be re­tained. If how­ev­er, the rel­e­vant ren­tal pe­ri­od is sub­se­quent­ly let, an ad­min­is­tra­tive fee of 20% will be re­tained and the bal­ance re­fund­ed. If there is a dif­fer­ence in rent re­ceived, S.A.R.L. Clos Mira­bel will be en­ti­tled to re­tain the dif­fer­ence. Smoking Policy Clos Mira­bel op­er­ates a strict NO SMOK­ING pol­i­cy in­side all the build­ings of the es­tate. Pets Policy Pets are welcome with prior notice.